Seatbelt Planet's display caught our eye at a trade show last spring. We had been restoring a Triumph TR-250 and wanted to stick with the old original seatbelts, but they were not in great condition. The webbing was dusty, worn and stiff. British parts catalog suppliers sold only modern replacement belts and we had no luck finding the factory correct bolts through online auctions. "TURN THIS . . . INTO THIS," said the Seatbelt Doctor sign that Mike Bosley was standing next to. Bosley is the owner of Seatbelt Planet and said that Seatbelt Doctor is one of the services he offers. "That's where we take the old seat belt webbing off and refurbish it and rebuild the seatbelt to where it looks new again," he explained. Seatbelt Doctor service can make the dirty, worn GM seatbelt on the bottom look like the refurbished pair of seatbelts on the top. 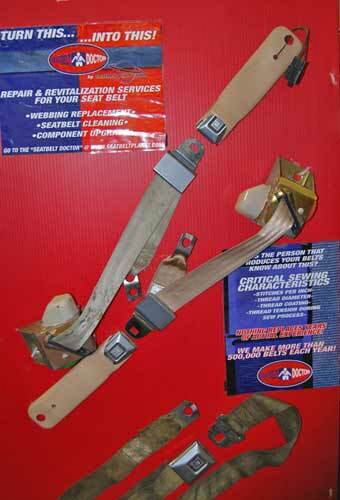 Refurbishing a seatbelt can include new webbing, new retractor systems and other new or cleaned up parts. Seatbelt planet evolved out of Beam's Seatbelts, which is one of the world's oldest seatbelt manufacturers. Tom Beam started the company in Oklahoma City in 1953. According to Bosley, it all started as a gas station. Beam built up a booming business installing automobile seat covers and he would sell car owners on the idea of installing seatbelts in their refurbished interior. "By 1955, he started making seatbelts," said Bosley. "At that point in time, seatbelts were distributed mainly as a fund raising item by Triple A, Lions Clubs, Rotaries, Boy Scouts and Jaycees. Mr. Beam would sell them seatbelts and they would take them to conventions to resell the seatbelts and take the markup for their charity or civic organization." Bosley said that he also heard a story about a man selling seatbelts door to door. "He would install them right in your driveway." Beam's start as a manufacturer coincided with Ford Motor Co.'s first offering factory installed seatbelts as an accessory in new vehicles. The safety equipment option wasn't very popular then, but in the late '50s doctors, industrial relations directors and safety directors in military installations began looking for sources of seatbelts. Beam's became the nation's leader in providing industry and military installations with seatbelts for retrofit applications in passenger cars. By 1962, seatbelt anchors were required in cars and some states were passing seatbelt laws. By that time, there were about 250 seatbelt manufacturers, compared to only a handful in the '50s. Beam's weathered the competitive storm, while other seatbelt companies went out of business. Bosley was trained as a mechanical engineer and then got a business degree. He became president of a much larger seatbelt company. When a manufacturer from Elkhart, Ind., purchased Beam's Bosley started Seatbelt Planet in Oklahoma City. He elected to specialize in the manufacturing of custom seatbelts. His company makes about 3,000 seatbelts a month, but does not service the OEM automotive market. Instead, he focuses on aftermarket seatbelts including custom seatbelts for classic cars and hot rods. He started the Seatbelt Doctor service for car enthusiasts who wanted to fix older seatbelts. "We do seatbelts for all manner of crazy applications from a Rolls-Royce installation for a customer in Chile to seatbelts for mowers and tractors," Bosley pointed out. "We have all the necessary equipment to build a certified seatbelt that meets the current highway safety standards," he said. "In most of the refurbishing work we do, people send us their seatbelts and we re-web them with new seatbelt webbing and we kind of clean up the hardware, too." Later, we attended a seminar that Bosley presented at the trade show. In it, he showed videos of what can happen in an accident and how seatbelts prevent injuries and death. He went over the standards required in a certified seatbelt. "It's not uncommon for people to take a little lower standard on safety with an older car," he emphasized. "There's really not much about a '55 Chevy that meets current safety standards; the weights are different, the center of mass is different and crumple zones are pretty much non-existent. The cars weren't originally built for safety, but adding seatbelts is one way you can improve that." 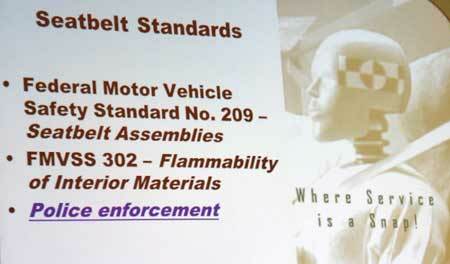 Visual aids used in Mike Bosley's seminar specified the standards for a certified seatbelt. Bosley said that it's important to have a standard to work to in doing a restoration or building a hot rod. "People who think safety is relative is something we experience with classic cars, hot rods and rebuilders," Bosley noted. "What's good enough for one builder might not be good enough for another, so we kind of have a high standard we work to at Seatbelt Planet; we do a lot of business with professional car builders who have to factor safety into their jobs." 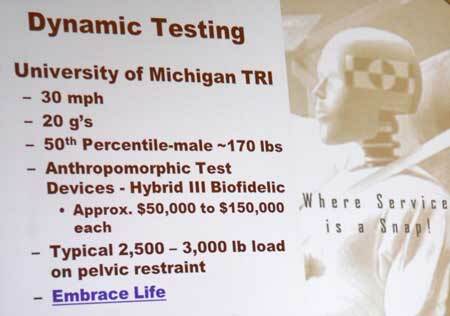 According to Bosley, the strongest load rating for a certified lap belt is 6000 lbs. He said seatbelts have to perform in many ways from strength to ultra-violet light resistance. Buckles have to be dust resistant. The number of stitches per square inch of webbing is another factor, because needles weaken the fabric to a degree. There has to be enough stitching, but not too much. In abrasion testing, the webbing must retain 75 percent of its original shape. The seatbelt path is important too; if it is rubbing against something it might cause fraying. Dynamic testing is one way to check the performance of different types os seat belts. The before and after seat belts on the trade show exhibit showed how old seatbelts can be decayed, weathered and become stiff. He added that dog damage is actually a big problem, too. One of the belts mounted on the display was from a Mustang, but Bosley said he couldn't think of a single make or model of car that stands out as having more seatbelt problems than others. "We have enough different colors and types of webbing that we can re-web most collector cars," he said. "But we don't restore or re-plate the buckles and all that. "We are a custom manufacturer of new seatbelts and we can re-web and clean old ones."